ROUGH TRUCKS : The Central Coast Monster Skate Park Series takes place on April 4 in Grover Beach, 1750 Ramona Drive, April 18 in Templeton at 6th and Main Streets, May 2 at the Paso Robles Skate Park at 19th and Riverside, May 16 in SLO at Santa Rosa Park, and May 30 in Los Osos, 2180 Palisades Ave. Participate or watch, but don’t miss this one-of-a-kind skateboarding event. Registration starts at 9 a.m., the contest begins at 11 a.m. Info on the skateboarding contests is available at ccmonsterskate.com. Monument Board Shop cultivates local skating talent. They’re located in Arroyo Grande at 1402 Grand Ave. Info: monumentboardshop.com or 473-1144. 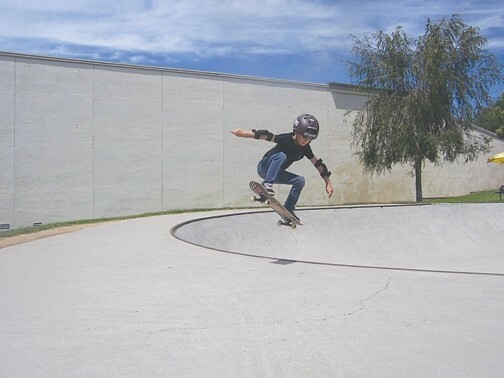 Arroyo Grande resident and 8-year-old Monument Board Shop team skater Elijah Muguira plans on shredding a lot in the coming months at the Monster Skate Park series. Muguira has ollied over full cups of coffee and water bottles, and is known as one of the youngest, most successful skateboarders around. He is also a man of few words. Muguira and his proud parents, Liz and Moses, sat down and talked with New Times, skateboard in hand. New Times How long have you been skateboarding, Elijah? Muguira Since I was 4. New Times And how many years is that? New Times Who introduced you to the sport? Muguira I picked up a skateboard and got on it and then ... I don’t know how. I just stuck to it. New Times So you’re a natural. What do you like about skateboarding? Muguira It entertains me when I get mad or something, that’s what I do. And when I’m happy I skateboard. New Times Which older skateboarders do you look up to, who’ve influenced you? Muguira Tony Hawk, Ryan Sheckler, Danny Way—and I think that’s all. New Times How did you get involved in the Central Coast Monster Skateboarding contest? Muguira Uhhhh ... I tried one, I liked it, I won, so I kept going. Liz Tell her about the first contest you skated in when Monument saw you and decided they wanted to sponsor you. Muguira I signed up but then I didn’t want to go out there and then they helped me by going out there with me, and then I stayed out. I won first place in my first contest. New Times Wow, when was that? Muguira When I was 5. New Times He tried his first contest without a sponsor? Liz Yeah, and then Monument’s team manager at the time said, “If you do this contest, we want to sponsor you.” Elijah wanted to skate but he was scared, nervous and crying on that first run. Monument has been a great support. New Times Where is your favorite place to skate? New Times How has skateboarding shaped his young life? He is talented and mature, but skateboarding seems to be a pretty rough hobby. Liz Yeah, even at 1 year old he was mature. We called him a little old man. Moses He is an independent little kid. He wants to skate when he wants to skate. New Times Do you practice, Elijah? Muguira Yeah. I’ll go to the skate park and think about what I want to do for my runs. I plan it ahead of time. New Times Give me an example of how you’ll wow them at Grover. Muguira I’ll go out on the big bowl and do a big ollie. New Times And you brought your skateboard with you today. [It’s almost as big as he is.] Show me that thing. Moses He goes through a lot of boards. Muguira I haven’t broken one yet, but I’ve worn them out. New Times Do you get nervous before a contest? Muguira I’m excited and nervous at the same time. New Times And you’re never scared? Moses Why should people skate, Elijah? Muguira Because it’s exciting and it gets my anger away. Liz How do you feel when you’re cruising on your cruiser? New Times Let’s end it on that note. Christy Heron is so over you. Leave her alone at cheron@newtimesslo.com.